There is a two year gap between reading this book and the first two Graveyard Queen books, so it took a little work to recall a lot of the situations and events that have lead Amelia Gray to this point in the series. And I can't help but think that, even with my two year gap, The Prophet is the stronger of the three installments. A lot happens in this book and a lot of development takes place throughout The Prophet (just as a lot of development had taken place leading up to this third Graveyard Queen book). Amelia returns to Charleston after her incidents in Asher Falls only to stumble upon a new mystery and new developments in her life. The ghost of a murdered cop is pleading for her assistance in finding his killer in a mystery that may involve more people surrounding her life than she would have liked. A new sinister evil has arrived in town: a man connected to John Devlin and his deceased wife, as well as a man who has tapped into Amelia's ability to see spirits and is now watching her. Meanwhile, Amelia's feelings for John Devlin have only grown stronger despite their time apart, but his secrets are many and his ghosts continue to haunt him--a fact that makes him a dangerous man for Amelia to be around. And the ghost of his young daughter continues to reach out to Amelia with a plea of her own that Amelia isn't sure she can help fulfill. Time seems to be running out for Amelia since the presence of these ghosts in her life will only drain her own energy and life force unless she can figure out how to help them move on. This book is written SO BEAUTIFULLY! The details and descriptions make you feel like you are right there with Amelia in the gorgeous southern Charleston streets. On the flip side, the eeriness of Amelia's ghostly encounters present a creepy, dark undertone, even if not a straight out chilling effect. The murder of Robert Fremont (nicknamed 'The Prophet') is an intriguing progression of great investigation and twists... even if it seemed a little noticeable what the main cause of his death had been. I had my guesses as to the murderer's identity, just as I had my guesses as to how Devlin was tied into the entire scenario. 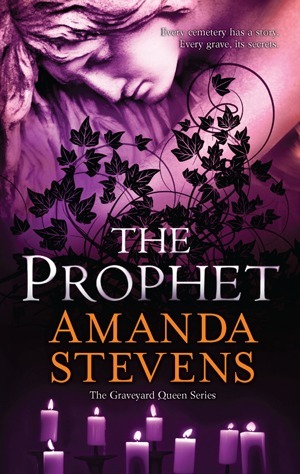 The mystery part of The Prophet was written very well and kept me hooked until the end. Nevertheless, Fremont was a welcome presence, almost like a guide pointing Amelia to where she needed to go or what she needed to do to come upon the final conclusion that would tie all the loose ends she'd been stumbling upon together. Even the development of Amelia's further acceptance of her ability to see ghosts was brought about nicely. I also loved the brief tidbits inserted about her graveyard restoration project and the bits and pieces of facts about black magic, root doctors, and the like. I'm intrigued enough to do some research of my own. The only quibble I had with this book was the romance. Maybe I hadn't remembered the love story between Amelia and Devlin being that deep and that passionate, which is what's causing my biased opinion. But I feel like Amelia was spending too much time obsessing over Devlin in a very unhealthy "You're meant to be my one and only love in the world" way. At the same time, she acknowledges that she should be turning the other way, or maybe NOT acting on her strange impulses to just show up at his doorstep. But because of her strange impulses to chase after Devlin, we get to lead into secret reveals and new knowledge that ties into the murder mystery. And so I'm slightly conflicted about how to feel about Amelia's almost one-tracked focus on John Devlin and how much in love with him she is. It's a little disconcerting... but I got through it... and it helped progress the story line. So... well... I guess, in the end, it didn't really bother me too much and in fact managed to add to the story. So I'll take it. Also, kudos to the semi-creepy open-ended conclusion.